Nestled in the beautiful Sorrento hills and with breathtaking views over the Gulf of Naples, La Terrazza sul Golfo is a relaxing home from home and the perfect retreat. Sleeps 4. Newly renovated, this beautiful apartment is perfectly located for families wishing to explore both the Sorrento and Amalfi coasts. This charming apartment is on the second floor, accessed via a flight of steps. The homely accommodation is on one level. 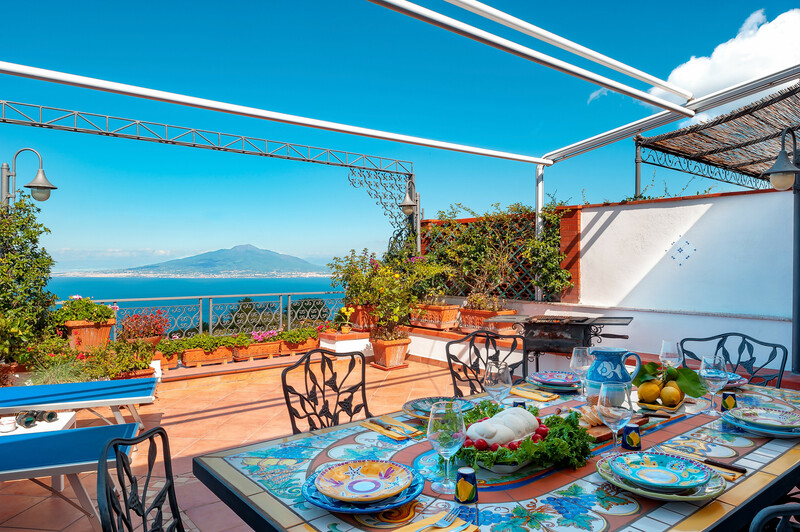 The property has a beautifully planted balcony and terrace on two sides and enjoys amazing views over the hills and across the Gulf of Naples and Mount Vesuvius. The apartment is a truly sociable space! 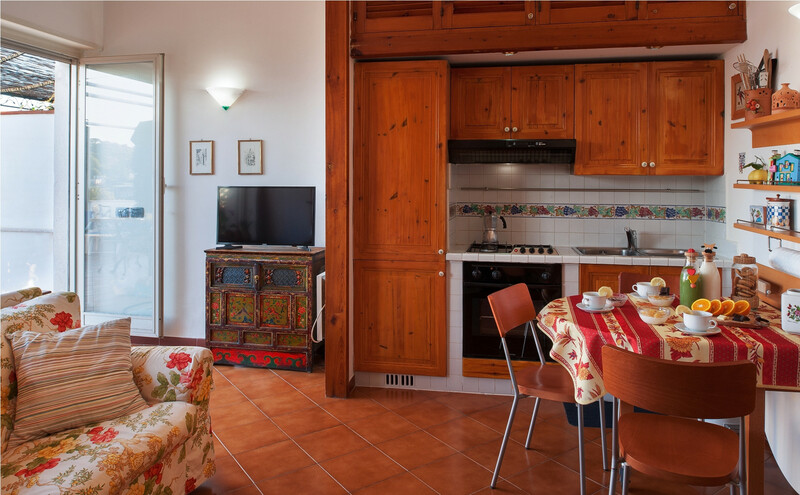 The main L-shaped room has a cosy kitchen/diner and around the corner is a comfortable sofa with TV for relaxing. The tiled kitchen is well equipped with an oven and hob, fridge-freezer, microwave and plenty of storage. The clever fold-out table will sit everyone if you plan to eat inside and folds away when you don’t. 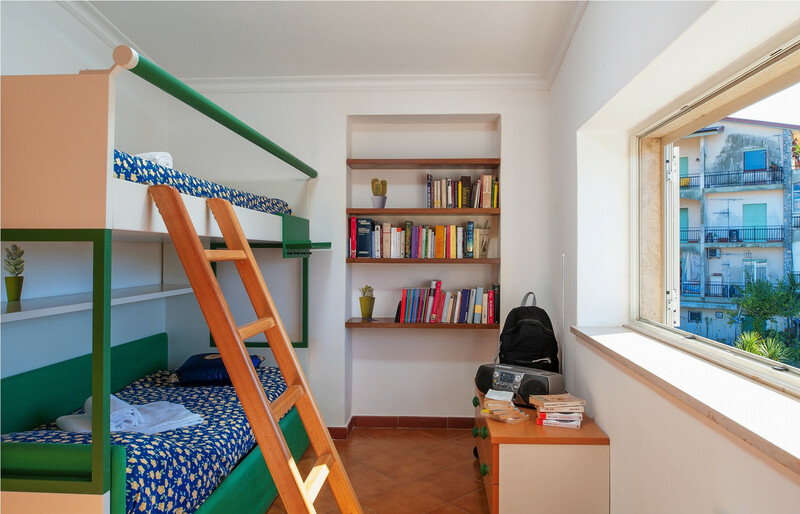 The two bedrooms offer flexible space for family or friends; one double bedroom has a large bed, the other has full-sized single bunk beds. Both rooms are light, colourfully accessorised and have plenty of storage. Off the bigger bedroom is a summer room with a large dining table; this leads out onto the balcony and has views of the hills and to Sant’Agata sui due Golfi. 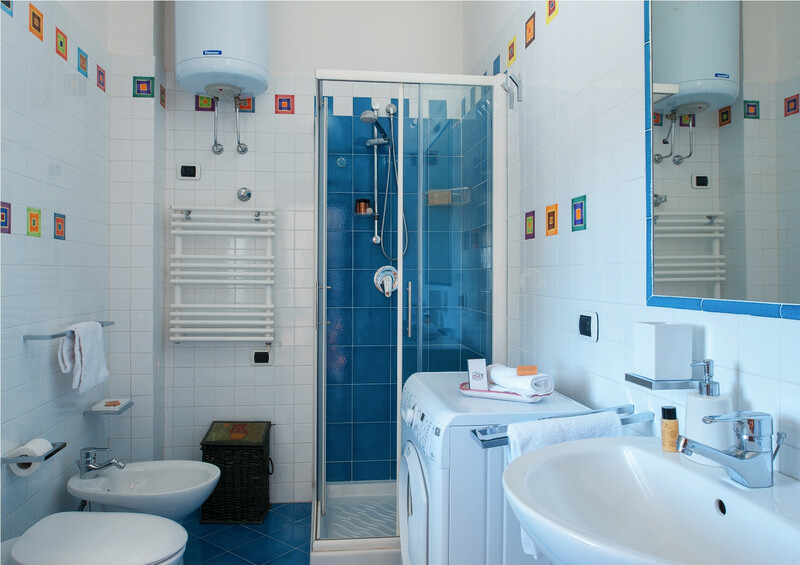 The bathroom is clean and bright with a shower, bidet and washing machine for your convenience. As its name implies, this apartment’s terrace really steals the show! Double doors open out from the kitchen onto the sizable terrace. If you can keep your eyes from the amazing view of the Gulf of Naples and the island of Capri, you will notice the mass of flowers and shrubs happily growing in pots amongst the relaxing garden furniture. This is an apartment for outside living; a shower to wash away a hot day, an artisan-tiled dining table to entertain around into the evening, relaxing loungers for soaking up the glorious sunshine, a barbecue for enjoying the local seafood and chairs and seats all over to wonder that view by day and by night. La Terrazza sul Golfo is just a 2-minute walk to the village of Sant’Agata sui due Golfi – a charming place, lively with shops, restaurants and coffee shops. 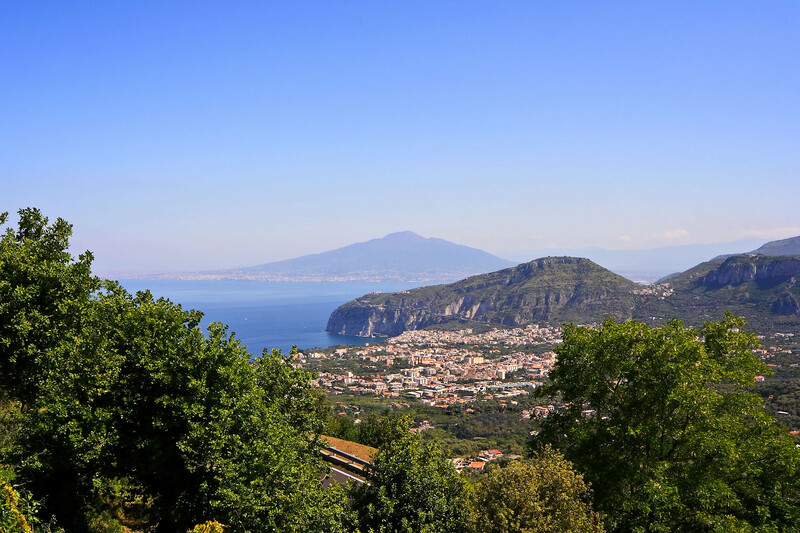 Sorrento is a 15-minute drive away with its winding, narrow, cobbled streets, splendid piazzas and beautiful views over the water to Naples and Mt Vesuvius. You will get by very well without a car; there are buses services to Sorrento, to the coast and to Nerano, in Sant’Agata sui due Golfi. The nearby town of Massa Lubrense – known as the ‘Land of the Sirens’ is 2.5 km away on the coast, with scenic, pastel-painted houses perched on the cliffs and boats in the small harbour. The town offers plenty of shopping, eateries and bars, as well as interesting cathedrals and other attractions. Why not explore the Sorrentine peninsula in all its glory? 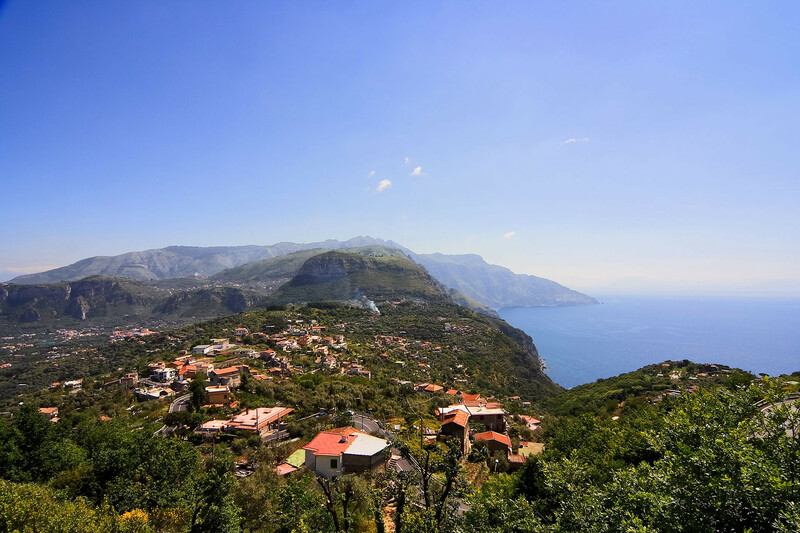 Nearby are iconic sites such as Pompeii, Positano and Capri; and the apartment is perfectly situated to allow you to explore the area’s magnificent countryside; paths and tracks criss-cross the hills and make for fabulous hikes – don’t miss the route from Nerano down to the fabulous Baia di Ieranto. However you want to explore this wonderful area, La Terrazza sul Golfo is the ideal place to do it in comfort and style. TV, 2nd floor, 50 m² terrace, barbecue, iron, internet (Wi-Fi), hair dryer, balcony, 70 m² property, single boiler on gas, air-conditioned. Super nett gestaltetes helles Apartment mit allem Equipment um sich wohl zu fühlen. Das Beste ist natürlich die großzügige Terrasse mit Grill, Dusche für heiße Tage, Liegen um sich zu entspannen und.... einen umwerfenden Blick auf das Meer und den Vesuv. Wir waren wegen der Verkehrsverhältnisse und den engen Gassen sehr froh, dass wir kein Auto gemietet hatten und kamen mit dem uns zur Verfügung gestellten Fahrplan sehr gut zurecht. Die nahe gelegenen Einkaufsmöglichkeiten reichten vollkommen aus, ganz davon abgesehen, dass sogar Waschpulver im Appartement vorhanden war. Wir waren äußerst zufrieden! Great accommodation with lovely views in a nice town. A good base to explore the area as long as you're happy to take the bus to and from Sorrento each time. We found the buses ran according to schedule and the bus stop isn't far from the apartment but you do need to plan if you're heading a fair distance, Vesuvius etc. Carmen was on hand for us throughout our stay and helped answer questions we had. I recommend the Capri boat trip that Carmen arranged for us. Picked us up from, and dropped us off at, the apartment. A great experience and much easier than getting the ferry from Sorrento.